Certificate of Papyrus | Papyrus Watch - Exposing the overuse of the Papyrus font. Imagine getting this as a thank you to your hard work? Apparently this is from lawbook.com which looks like it's chalk-full of fun online courses. 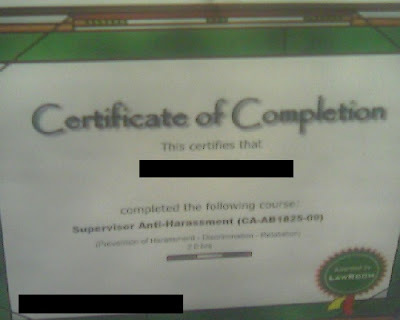 This one for Supervisor Anti-Harassment sounds especially exciting. Thanks to Loid for sending this shot, and sorry for your disappoint, we feel your pain.